Lighthouse-Academy: Interview with Georgiana Daniels and #Giveaway!!!! Interview with Georgiana Daniels and #Giveaway!!!! Today we welcome Georgiana Daniels to my blog. Georgiana is giving away one print copy of her book to a commenter. (USA only.) Please leave contact information. Thank you for the opportunity to talk about Shadows of Hope! It’s about a crisis pregnancy worker who is, herself, unable to have children. She then discovers that her husband is having a child with someone else—a woman that she’s vowed to help. In a larger sense, Shadows of Hope is about what happens when we face the worst thing we can imagine, just like the heroine does. Will we find our faith or lose it? All of us, at some point, will face a challenge beyond what we can handle in our own strength. Some will be tempted to fall away during a season where prayers seem to go unanswered and the unimaginable happens. But some will be refined as though by fire and grow closer to the Lord, allowing the trial to make them more like Christ. This is what I pray readers come away with because my heart is for those whose faith is challenged on every side. Honestly, I can’t remember! It happened so long ago that the specifics are fuzzy. I do remember my grandmother setting me up with my own “office” in her house when I’d go to visit, and I’d take those times and pound out my first stories. Death on Penthouse Avenue and Sign of the Jewel were two of my favorite early stories. Of course, I was just a kid and the stories were about adults, but none of that mattered to me. I was completely immersed in my story world! It’s all kind of funny, now that I think about it. We’re supposed to have a process? Just kidding! The thing is, my process is so messy that it can hardly be counted as such. I’m a turtle, slow and steady—light on the steady. It takes me a long time to write because that’s the season of life I’m in. Ideas roll around in my head for months before anything makes it onto the page. I’ll start out writing about the idea and characters in my journal and sketch out what the first few chapters might look like, but it’s really hard for me to think too far beyond that. However, I would not describe myself as a pantser because I love trying to organize my story and knowing what’s going to happen. In the rest of my life I’m a list maker/organizer/planner extraordinaire! But in my writing, not so much. When I write, I know the process will take me longer than most and that I will write fewer books than other writers do. I’ve made peace with that. Once the kids are grown and I’m not focusing so much on homeschooling, that may change. Enjoying the season of life I’m in is something that really matters. When I read, I love casting each character with an actor or actress whose work I’m familiar with because it makes the story come to life. When I write, the same thing applies. Marissa, the crisis pregnancy worker the story is centered around, would be played by Amanda Peet. She’s an actress I was originally unfamiliar with, but who looks exactly like I picture this character. Of course, once the cover came out my vision changed because the woman on the cover is, literally, perfect. Kaitlyn, the woman Marissa unknowingly befriends, would be played by Emily VanCamp. She has that fresh, almost innocent look that this character needs, which is a bit ironic considering the circumstances. But if you read it, you’ll see what I mean. Colin, the husband and antagonist, would be played by a younger Dermot Mulroney—the age he was in My Best Friend’s Wedding. Initially it was hard for me to picture him as the “bad guy” because I love Dermot’s work, but the look just fit. Who was your favorite character in Shadows of Hope? Marissa, hands down. Without giving too much of her character arc away, she always sacrifices what she wants or needs for others but discovers in the end that she matters too. Her strength increases with each challenge she faces. May the same be said of me, one day. I wish I had a firm project in the works! But remember my writing process, messy and slow? Yeah, that. I don’t have a current contract in the works, and while it’s disappointing on one hand, it’s also freeing. There is a novel I’ve been scratching out that presents an interesting moral dilemma and the idea intrigues me. But I will keep that one close to my heart for now because something else could pop up in the meantime. I will say that writing women’s fiction has been really satisfying because I can take a little time to explore gray areas, where right and wrong answers are not always so clear cut. Whatever I write next will likely follow that thread. Georgiana Daniels resides in the beautiful mountains of Arizona with her super-generous husband and three talented daughters. She graduated from Northern Arizona University with a bachelor's degree in public relations and now has the privilege of homeschooling by day and wrestling with the keyboard by night. She enjoys sharing God's love through fiction and is exceedingly thankful for her own happily ever after. Thank you so much for featuring me on your blog today! I had a lot of fun with this interview, especially thinking about casting! This is such a beautiful and heart-wrenching story! Georgiana is so fearless when it comes to putting her characters into realistic, rock-and-hard-place situations! You don't need to enter me for the giveaway. I already have a copy! I enjoyed reading this author interview! What a tough, emotional book subject. It sounds like a great read. 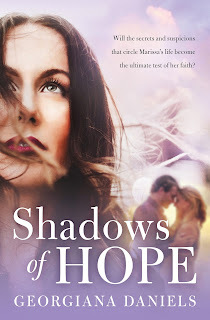 Georgiana Daniels' book, Shadows of Hope, will be an emotional read and to see how the heroine's faith goes. The reality of the story is happening to often in our society today thus this will story will definitely touch lives. Thank you for the interview and giveaway. Having had to deal with infertility, having this sitation complicated would have to be unbelievable, as one of the the worst that could happen! This book sounds really good. Thanks for the chance at the giveaway.